.......and of course there is Percy! Thank you John. Wasn't sure how to do that and agree with your comment. Still waiting for the completion of DCC and sound install; taking much longer that I had hoped for. I *believe* lots of people around the world model US railroads/railroading. 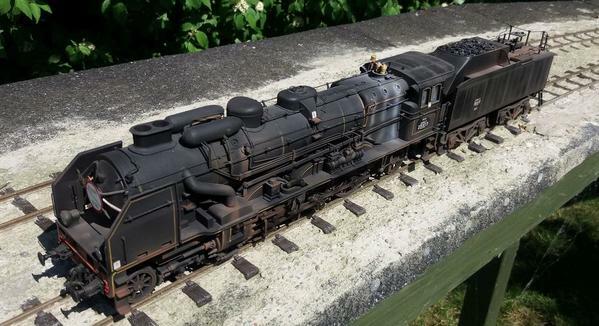 I was just looking at a real nice model railroad by a guy in Sweden ... a UP western US layout with AC44's and such. But, do many Americans run trains from another land? MTH sells them, right? I don't know if I would call it "modeling" European trains but I'm about to purchase the Orient Express set from MTH as these are things of absolute beauty. And we've always intendEd to make our smaller layout town have that Teutonic/European feel to it. I find the structures, cobblestone streets and squares to be so picturesque. have 6 of them on my shelves. 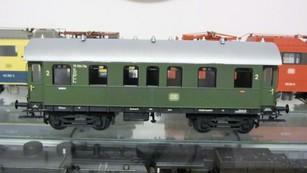 the Hornby #2 Corridor coaches. Enjoy the photos. Sorry, if dealers/retailers/distributors/manufacturers are excluded, because I tried to avoid overloading this list with adverisements. Also Z, N, TT, HO, S, 1, G sources are excluded from this list. This list is just attempt to map specifically the European coarse scale O gauge (vintage and modern tinplate) and O scale (1:43,5 and 1:45) situation, which can be extended by any forum member, if you happen to have some more European sources. Please, keep in mind to get in contact with the mentioned clubs in advance and ask for an appointment, because most of them are small clubs in private premises with irregular opening hours. Some of the clubs attend at scheduled public events during weekends. Thank you for this great resource - especially organized by nation. Umm...yes. Rivarossi and Lima...so far. I find European trains, and German ones in particular, fascinating...they are so very different from what we are used to here in the States. 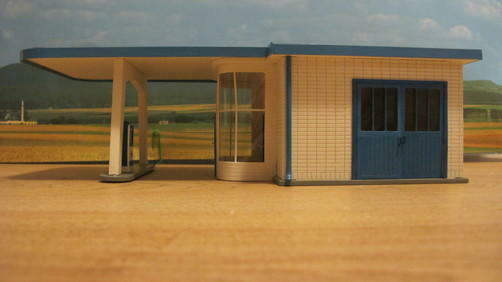 I have a LGB layout on the second floor I built in 1989. We are in Europe once or twice a year. I have always found continental railways very interesting. 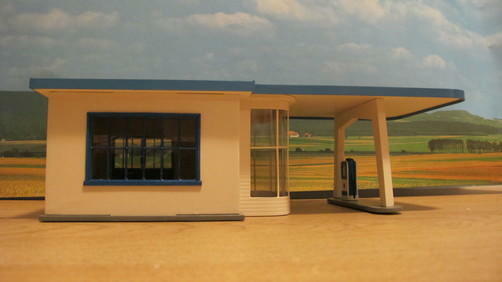 My Lionel layout depicts the northeast in the late fifties, my LGB layout about the same time period in east Germany. I like them both. It appears that we are a more cosmopolitan group than one might imagine! As I think I may have mentioned in another thread, this "lok" came to me with missing buffers, and only one powered truck, and that was not running. There's only so much I'll be able to do, what with the truck-mounted couplers. Am waiting on some proper size wire to replace the large handrails below the windscreens. Since this is (currently) my only German loco, I'm able to focus on it exclusively and hopefully will end up with a half-way decent model when I'm "done". you could replace the ugly Lima/Rivarossi couplers by using Bing/ACE/Darstaed-type hook couplers, which look much more realistic, you can find them on the britsh ebay.co.uk while searching for Darstaed products. 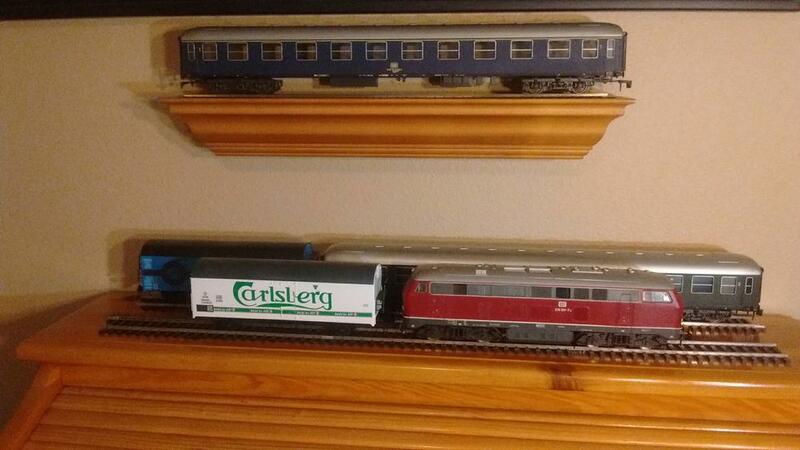 Nice, I see you are running 2-rail O-scale era mixed era (loco from era V and scenery vehicles era III). 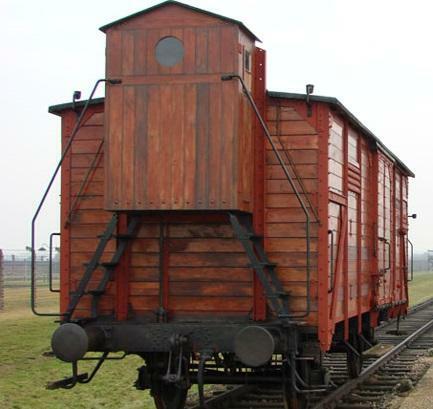 While running modern European trains, I prefer plenty of coaches in reduced length than few coaches in true scale length. Wow, very nice! Did you scratchbuild the buildings? I have a friend who lives in northern Great Britain. This is a quick layout video tour. Play time is only one minute. 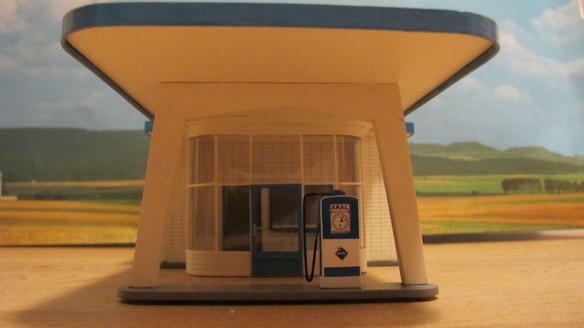 Dave's layout is in his attic and is OO Scale, like our HO Scale. The lithography of Hachette looks good but further they are flimsy build and the clockwork mechanism (which has plastic parts) is weak. I would not recommend these and go for the real Hornby. Here is the layout of one of the heirs of Ferdinand Porsche, located in southern Germany. 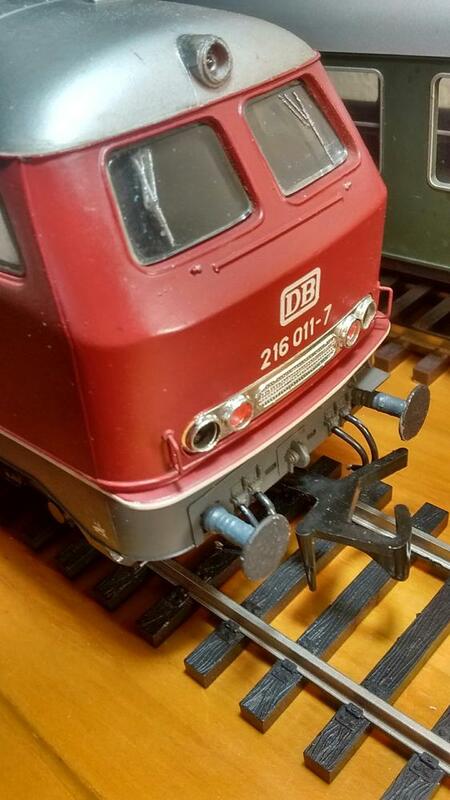 It appears to be O Gauge stud-rail, but I may be wrong. I think it is open to the public. No, it is HO with Märklin tracks, you will notice the crocodile teeth in the middle of the tracks, which are for AC power, instead of the center rail as we know from O gauge 3-rail. Thank you everyone for the kind comments. The buildings are all scratch built and some of my techniques were published in OGR in the mid 90's. 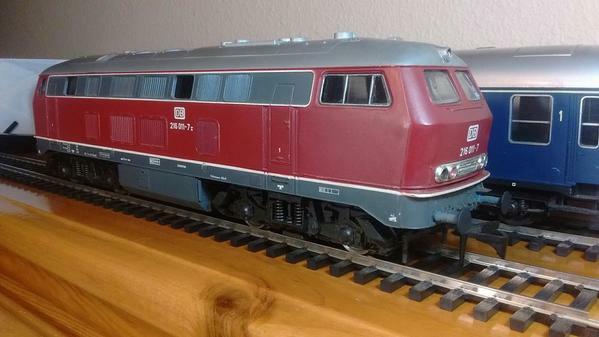 The locomotive was made by Huebner about 35 years ago but the repaint is fairly recent. All the coaches are old Rivarossi stock with cardboard interiors made in Germany in the late 90's. They take a while to assemble but are well worth it. Most of my rolling stock is epoch 3 but I also have lots of items from epoch 2 to contemporary models. It had been a while since I had run the Rivarossi coaches behind a powerful locomotive. If any of you read Continental Modeller, the layout was in the January issue. Huebner is superior quality, like Lenz, Kiss, Demko, Fulgurex, etc. Fred, I am a frequent visitor to your YouTube site. The way you are set up in the garden is amazing. Besides two rail I have a soft spot for French tinplate and postwar Lionel. The clockwork gears inside can be always replaced by MTH/Lionel motorization, no problem, not at all. Yesterday I received my very 1st Hachette wind-up clockwork electric loco and it is great, just great, you'll love it! Any way, together with Hachette litho cars queued in a row at the platform of MTH's Leipzig passenger station, which is by the way a Märklin vintage replica, would look great, just great, trust me. I have seen a photo where a guy disassembled the tinplate body of two Hachette PO-type locos (http://www.binnsroad.co.uk/railways/hachette/24.jpg) and made out of them a nice huge French S.N.C.F. 242.BE.I-type (http://www.apmfs.fr/242be1.html), just great, you'll love it! Maybe it looked like this? This is an Italian 3-rail 0-gauge car made by Elettren of Italy. Well I had some time to today to take some more videos with the help of my daughter. The locomotive is a Bavarian Glaskasten made by SCE of Berlin over thirty years ago. The three cars it is pulling are Bavarian branch lines coaches made by Lenz. To be honest, I could watch this train run all day. I have the MTH Orient Express Set pulled by the 2-3-1 Chappeon. I really do not like the O43; however, I was on many trains in France in the 50's and 60's with most pulled by steam and I will never forget all the steam including my looking down the stack while the engine went under the walk bridge. My mother got upset with my appearance after that introduction to cinders. My German friend who lives near the French southeastern boarder has his entire attic covered with every model of UP power. Between 1960ies and the 1980ies almost until the end of the former Yugoslavia I have frequently traveled on the Orient Express route. I recommend to watch the Agatha Christie and James Bond movies covering this topic. My Fulgurex BR 18 Gauge 1 engine. Had DCC and Zimo sound installed. I model OO/HO. It's basically a small 4x8 layout based around the GWR that I am currently building. 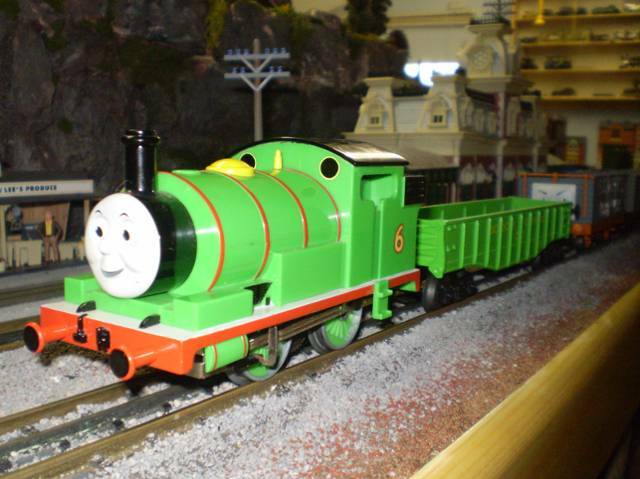 I plan to operate a 14xx and autocoach for passenger services and maybe get a GWR toad brakevan for goods trains. Well, I have not posted in a while, but at least I have had the chance to build a few kits.